Interfaith Ramadan: What do Italians eat for Breakfast? A series of useful snippets of information for people travelling to italy for holidays or planning on living in Italy for a longer period. I hope to add many articles relating to travel, food and culture in the future. The first thing I learned in Italy is that Cappuccino is a morning drink and should not be ordered after midday unless you don't mind the judging stares! For many Italians, cappuccino IS breakfast. 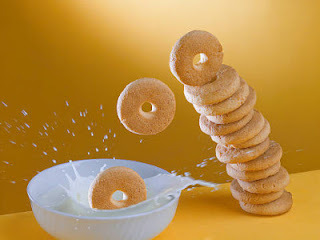 Speaking of breakfast, the most common item for breakfast are biscuits dipped into warm milk or a cappuccino. Having Eggs or meat for breakfast is a big no-no as they are considered to be far too heavy in the morning. When out and about, Italians usually grab a brioche for breakfast. A morning espresso is key and you will find yourself addicted if you stay for a prolonged period. 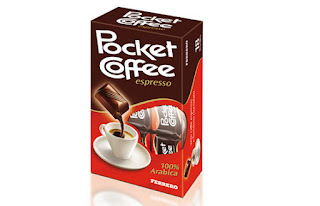 I couldn't cope with espresso when I first arrived in Italy, now I'm unable to function if I forget my morning espresso. For students on an all-nighter, there's the option of the double brewed espresso (filling the cafetiere with freshly brewed espresso and brewing it again with a second dose of ground coffee). I also once heard of a student sitting down to a breakfast consisting of a bowl of coffee with a espresso on the side! In terms of snacks (le merende), Ferrero rules! There’s Ferrero Kinder for children and espresso chocolates called ‘Pocket Coffee’ for adults if you missed your morning espresso. There isn't perhaps the same choice in confectionery as there is in the UK (I've yet to find chocolate-flavoured chocolate or honeycomb for instance) but it still hits the spot. Needless to say, nutella is spread over everything. It’s even in pasties!! 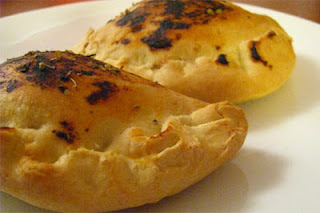 These are called panzerotti in Italian are freshly baked in a pizzeria. My advice? Don't let your eyes get the better of you and share a panzerotti with a friend, maybe even two! And as a final random fact, eating horse meat does not have the same stigma in Italy as it does in the UK and it’s not uncommon to see thin steaks in more upmarket supermarkets. So if you fancy a try and want to avoid eating it by mistake, watch out for the word cavallo (horse). Mashallah must be exciting and such an experience to live in Italy and be a new muslimah too. Wow the breakfast seems a little boring... would not suit me well. I love to have a big breakfast, cereal, fried egg on toast with brown sauce, Some moroccan flat bread Mafrouk and one cup of coffee and glass of fresh OJ. I love a large breakfast too. My habits have changed since living here though and now I just eat little brioche in the morning. The morning coffee has become a must though - I really notice the difference if I skip it! Moroccan breakfast sound delicious! I was thinking of visiting Italy with my husband.... Never been ever. where would you suggest we visit. I love history, especially old streets, buildings, architecture and beautiful scenery. I was looking into Venice... but also interested in Rome. Do you think its possible to visit both and have a good look around without rushing? I was thinking 6 nights would be enough. I spent 4 nights in Paris and that was just right.